The george pen is elegant simplicity personified. The sleek lines of the pen lend to the overall balance and comfort experienced while writing. The clip while functional, is also stylish, expressing curves in the art nouveau style. Plated with an antique brass finish, the pen screams VINTAGE and is an eye catcher. 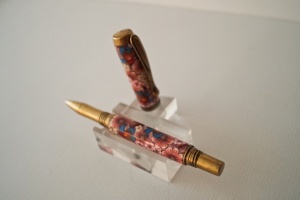 The pen is dressed with a floral pattern made from Polymer Clay by world renouned artist Toni Ransfield. The artist makes each element of the design from a single rolled clay cane. Each flower, insect, etc is mad ein the fashion. Then the clay is sliced and hand placed on the brass tube that supports the pen. It's then fille in and "fired"/"Cured" in the oven. Later is turned and finished by us. The pen comes with a Schmidt 5888 fine black refill. These are the refills we recommend.